As we are a Certified Professional Builder and member of the Association of Professional Builders, we are 100% committed to providing you with our outstanding and highest levels of service with the quality of our work. We know that our reputation as a reliable, reputable builder depends on our services, professionalism and guarantees we provide. To reply to you within 2 working days. To finish your project on time and on budget. To always communicate with you in an honest, clear and positive manner. All tradesmen on our site have been vetted to comply to our professional requirements and their workmanship is of the highest standards. To arrive at our appointments with you on time, every time. To use only the highest quality materials available for your new home. We deliver a defects list and practical completion report completed by our director and builder with every handover. To deliver on every single commitment we make to you. We provide you with access to to our client portal either through the desktop login or downloading our very own app. Here, you have access to your job information 24 hours a day, 7 days a week. This gives you seamless communication, control of your budget, an updated live schedule and daily logs so you know what happens on site every day. We provide a seven year structural Warranty. To continue to engage in ongoing professional development that ensures our professional processes and procedures result in the best customer experience for you. Our sites are cleaned daily after our trades have completed their tasks. To find solutions that fit within your budget and needs. Thinking of Building a New Home in Brisbane or Gold Coast? 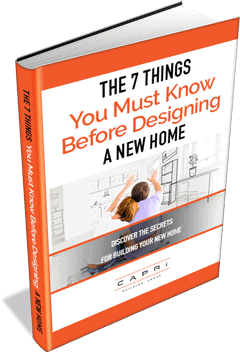 We Reveal The 7 Things You Must Know Before Designing A New Home & You Will Discover The Secrets To Build Your Perfect Home.